The Supreme Court on Thursday extended till September 12, the house arrest of five rights activists in connection with the violence in Koregaon-Bhima in Maharashtra. A bench headed by Chief Justice Dipak Misra took umbrage over the statements given by the Assistant Commissioner of Police of Pune on the matter, saying he was casting aspersions on the court. The bench, which also comprised Justices A M Khanwilkar and D Y Chandrachud, told the Maharashtra government to make its police officials "more responsible" on matters pending before the court. "You must ask your police officials to be more responsible. The matter is before us and we don't want to hear from police officials that the Supreme Court is wrong," the bench told ASG Tushar Mehta, who was appearing for Maharashtra government. The bench also asked petitioner Romila Thapar and others to satisfy it on whether a third party could intervene in a criminal case. Meanwhile, Mehta told the bench that keeping the activists under house arrest would hamper the ongoing investigation. The bench posted the matter for further hearing on September 12. The Maharashtra government had yesterday told the apex court that the five rights activists were arrested due to the cogent evidence linking them with the banned CPI(Maoist) and not because of their dissenting views. The state police had filed the affidavit in response to a plea of historian Romila Thapar and four others, challenging the arrest of the five activists in connection with the Koregaon-Bhima violence case, and claimed that they were planning to carry out violence in the country and ambush the security forces. 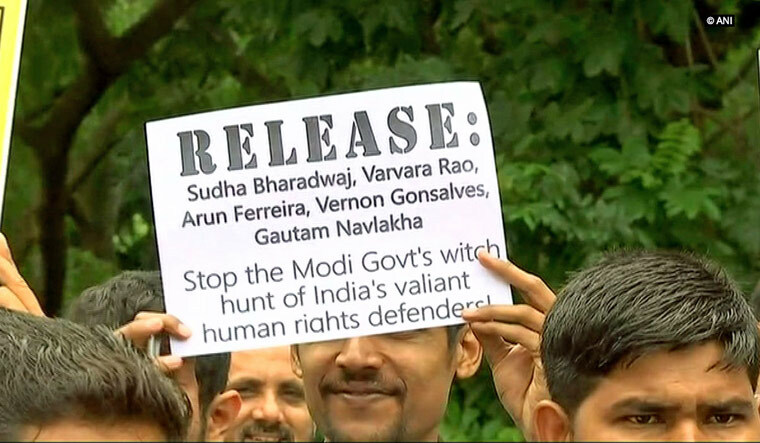 While prominent Telugu poet Varavara Rao was arrested from Hyderabad, activists Vernon Gonsalves and Arun Ferreira were nabbed from Mumbai, trade union activist Sudha Bharadwaj from Faridabad and civil liberties activist Gautam Navlakha was arrested from Delhi. The raids were carried out as part of a probe into an event called Elgar Parishad, or conclave, on December 31 last year, which had later triggered violence at Koregaon-Bhima village in Pune district of Maharashtra.